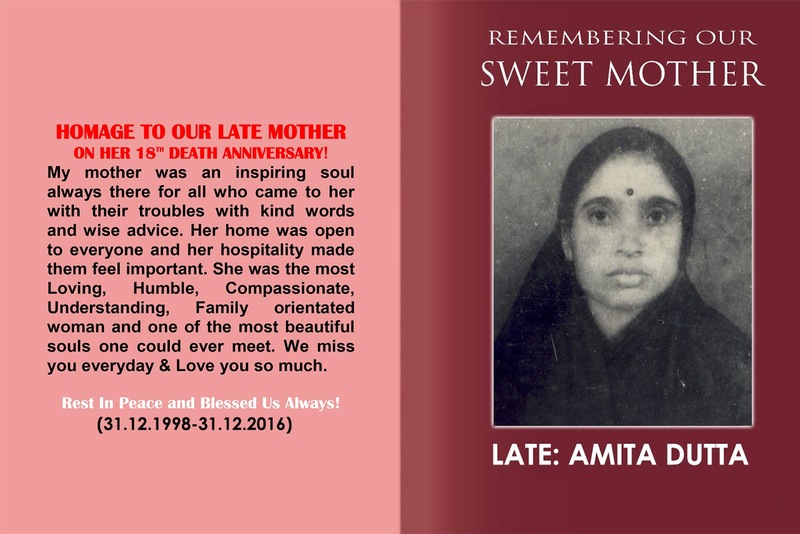 GK Dutta > DAILY BLOG > HOMAGE TO OUR LATE MOTHER ON HER 18TH DEATH ANNIVERSARY! Don’t worry about anything Raju. You’re never alone. You’ve got me. I’ll always be here for you,” my mother would always say. And she was always there for me – and for my sisters and for many others too. Always. Ma, Mom, Mommy. She took this role very seriously and never wavered. No matter what. She played important role in our lives… And then there are the 18 years (31.12.1998) since our mother’s death. To the world you were one person, but to me you were the world. You didn’t have much, but we always felt like we had everything. You didn’t leave millions in your bank account, but you left a legacy worth much more. You taught me love, patience and endurance. You taught me how to pray and led by example. You praised me whenever I did good and pointed out my mistakes with that gentle voice. You encouraged me to work hard in school and taught me how to read and write. I still remember your voice as you read me bedtime stories. I think about you every day. I was devastated when you feel ill. In a matter of days, the smile on your face disappeared and was replaced by gloom. I remember I couldn’t leave your side for one sec. I will never forget that fateful Sunday afternoon when you said goodbye forever. The cruel hand of death had snatched you away from us. We miss you every day. I thank God for you and cherish the memories we made. I love you.